Mrs. Refined Sugar and I have been friends for a long time, back when we were both unrefined. We shared some strange food adventures in our younger years, the details of which I will spare you, except to divulge that we chewed paper and analyzed various pulp qualities. Besides a few odd adolescent experiments, we ate very well between our two houses and experimented with our own cooking once we could be trusted. Now grown and living a few cities apart, we support each other’s independent culinary explorations, her’s being the highly successful ice cream blog, 365 Scoops. It was a true feat to steal away Mrs. Refined Sugar from her eight month old baby, Sugar in the Raw, to meet for a day in one of East Coast’s most advanced gluten-free foodie cities, Philadelphia. For weeks we looked forward to indulging our now more sophisticated palettes with some quality grub. Between Refined Sugar’s vegetarian habits and my gluten-free demands, we narrowed down our options to a few recommended locations. I knew we were on the same page when we arrived wearing the same black, elastic waistband leggings: make room for food! We started our eating tour with a light lunch at HipCityVeg, a locally sourced, environmentally friendly, vegan sandwich and salad joint. This fast-food spot has just one location off of Rittenhouse Square. I imagine the concept would make for a highly successful chain. The menu airs on the healthy side with a few treats mixed in, such as sweet potato fries and a few desserts. 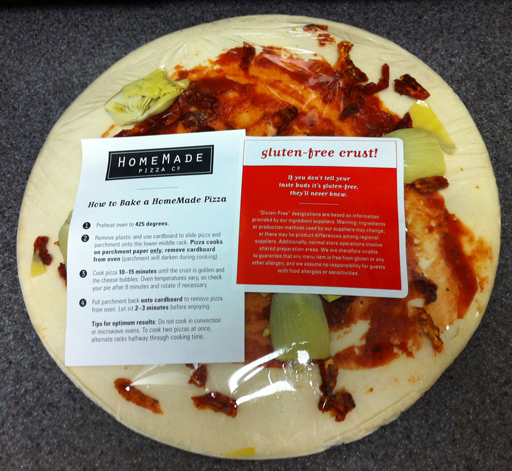 There are a number of gluten-free options and the staff is extremely versed in parsing ingredient lists to help navigate allergen-free choices, refreshing for a fast-food establishment. Mrs. Refined Sugar and I both ordered the Bistro Bella sandwich, mine deconstructed on a pile of arugula instead of the bun. The salad contained herb glazed portobello mushrooms, olive tapenade, tomato, artichokes and red onion, a unique alternative to my tired salad repertoire. With fuel to burn we were off to shop, what else? By late afternoon we were ready to recharge at Sweet Freedom, Philadelphia’s only bakery free of (long inhale) gluten, dairy, egg, corn, soy, peanut, casein and refined sugar (no offense to my companion of the same name). As we entered this sweet treat mecca, I checked my gluten-guard at the door and surveyed the cupcakes, donuts, cookies, brownies, oat crumbles, cake balls, etc. Mrs. Refined Sugar left the ordering to me, a weighty task. The friendly associate recommended the strawberry shortcake cupcake, yes please, and I couldn’t resist the chocolate salted caramel cupcake. 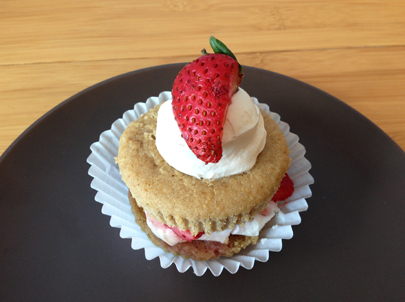 Our fruity pick was a creative combination of classic shortcake and trendy cupcake. The dense, vanilla flavored, scone-like cake was layered with dairy-free cream, fresh strawberries and just a touch of strawberry syrup. 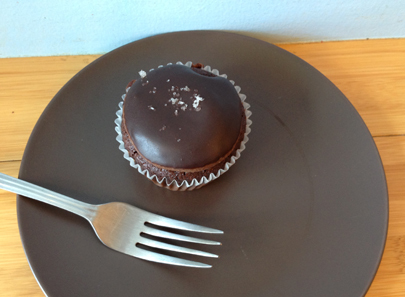 This not-too-sweet delectable paired nicely with the rich and chocolaty cupcake, oozing gooey caramel from its center. A fudgy chocolate frosting was sprinkled with flakes of sea salt, rounding out a most stimulating feast for the taste buds. Before leaving we felt it our duty to sample the newly released bread loaf that Sweet Freedom has worked diligently to perfect. 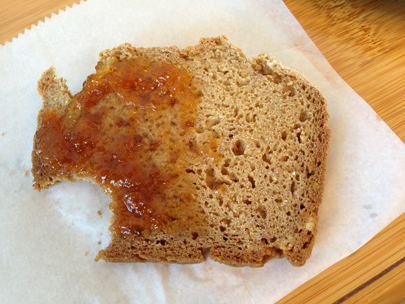 Toasted with a smear of apricot jam, it was quite satiating. However standing alone, the slice was slightly too dense and bitter in flavor for my taste. Not bad for a first run, but perhaps in need of some more fine tuning. After a quick visit to The Barnes Foundation’s world-famous art collection in its new Philadelphia home, we rushed to make our dinner reservation. The final stop of the day was Zahav, a gem tucked away on quiet St. James Place. Chef and owner Michael Solomonov was born in Israel and raised in Pittsburgh, PA. At the age of 19 he returned to Israel, fell into the culinary world, and later returned to work in the restaurant industry in Philadelphia. The death of his brother in the Israeli army clarified for Solomonov his mission to share the flavors of his native land, and Zahav was born. Stepping into the airy, limestone laden dining space and peering into the open kitchen, Mrs. Refined Sugar and I both had the same first impression: We’ve just entered Yotam Ottolenghi and Sami Tamimi’s Jerusalem cookbook. 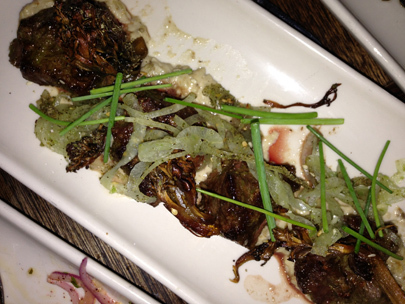 Yet Zahav offers its own interpretation of the the little country’s big flavors. 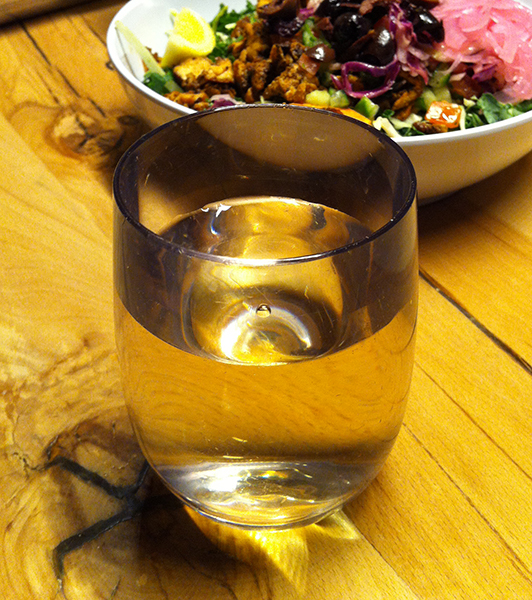 We were greeted by an enthusiastic server who was unperturbed by our many dietary restrictions. She grabbed a pen and swiftly lined through items to avoid on each of our paper menus. Not surprisingly, Mrs. Refined Sugar’s vegetarian sheet was more marked up than mine. The server then explained the restaurant’s sharing style and pointed out the tempting $39 Tayim tasting menu, which offers a generous sampling from each section of the menu. We weighed our should’s and could’s over a Lemonnana cocktail and Israeli Salad Martini and decided the day called for an indulgent finale. 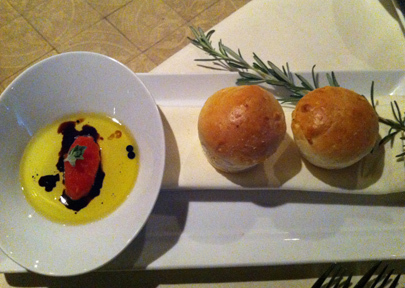 Our tasting menu began with half a dozen fresh salatim (salads), hummus, freshly baked pita for Mrs. Refined Sugar, and cucumber slices for me. Small bowls filled with beets in house-made tahini, pureed eggplant, sliced fennel, spicy green beans, chopped cucumber, and creamy hummus were all gluten-free. I avoided the tabouli salad, a cracked wheat based dish. 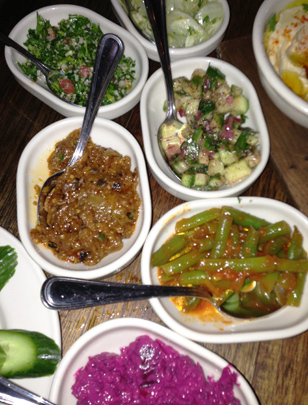 The first course alone would have left us buzzing about Zahav. But there was much more to come. Aware of our limited time, our server kept the food rolling with a second set of dishes: the watermelon salad with marinated cobia, israeli olives and smoked honey; the roasted zucchini with bulgarian feta, hazelnuts and zucchini babaganoush; and the heirloom tomato salad with matbucha (roasted tomatoes) and house-made ricotta. We ferociously tasted each plate’s complex combination of flavors and textures. A symphony of “mmmm’s” hummed from our table. 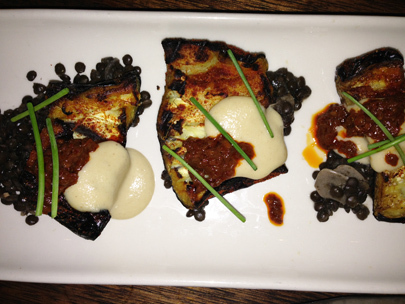 The Al Ha’esh (grilled over coals) course followed with spiced eggplant, prepared with harissa, black lentils and garlic tehina, and the highly recommended hanger steak with babaganoush, mushrooms and spicy schoug. (I channeled Mr. Green Bean for my one meaty choice.) Our server graciously treated us to the trumpet mushrooms, which we had been eyeing, served with shakshuka, fried egg and legumes. A dozen or so dishes now crowded our little table, and we attempted to take it all in (figuratively of course, we couldn’t possibly clean our plates). With our elastic waistbands fully extended we made room for just a few bites of dessert. 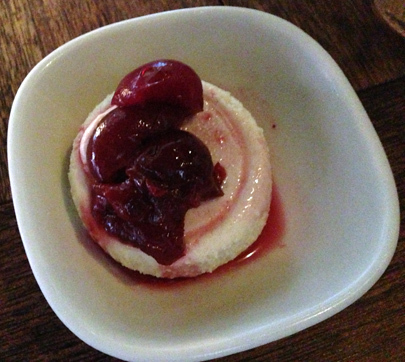 I ordered the tahini semifreddo, a rich and creamy mousse with hints of nutty sesame flavor, accented by sweet cherry compote topping. I melted over a couple of spoonfuls and still regret not taking the rest home. 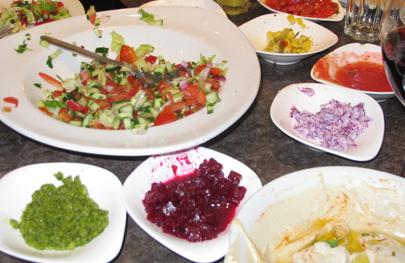 Overall, elaborate preparations and beautiful presentations of fresh produce, hearty grains and quality proteins resulted in an impressive representation of the melting pot of Israeli cuisine. I am critical of the kitchen’s heavy hand with salt and weak pour for expensive cocktails, small crimes for an otherwise first-rate meal. Although the establishments we visited offered some pretty delicious items, credit must be given as well to Mrs. Refined Sugar. Some dining partners just make food taste a little sweeter and a little richer. Before we parted ways, we made plans for a reprise rendezvous in The City of Brotherly (and gluten-free) Love. Categories: 4 Spoons, Dessert, Dinner, Fast food, Gluten-Free, Israeli, Local, Lunch, Middle Eastern, Organic, Philadelphia, Small Plates, Sustainable, Vegan | Permalink. Fresh off the plane and hazy with jetlag, Aunt Fudgie took us for our first dinner to Gehalim, a typical Middle Eastern, family style restaurant. Dozens of salads and dips accompanied by warm fluffy pitas were sprawled across the table as the server took our order for meat skewers to round off the meal. Israelis love to break and swipe pieces of pita through plates of hummus (chickpea spread), baba ganoush (pureed eggplant), and labneh (soft strained cheese), leaving traces of flour on table tops and in shared spreads. 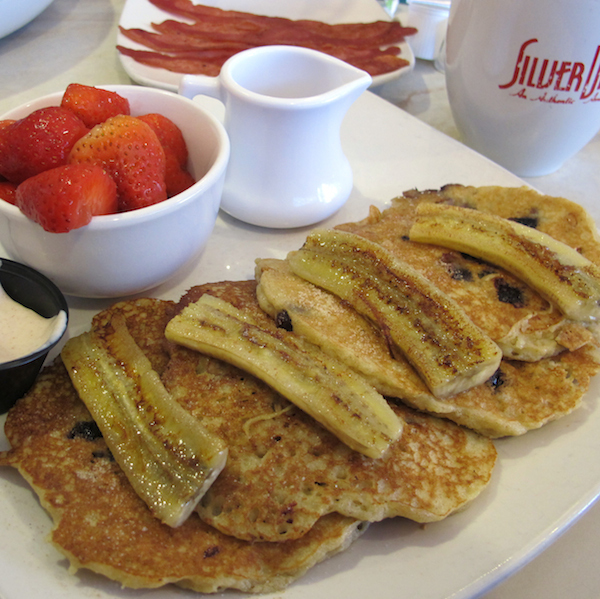 Gluten-free diners can advocate for serving spoons. But as habits are tough to break (and Israelis are a stubborn bunch—generalization #2), I reached for the spreads first and served myself a sampling before the rest started dipping. 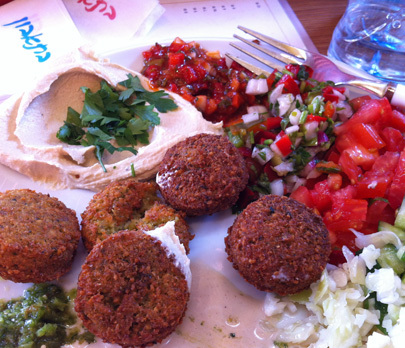 Our introduction to Israeli dining revealed some trends we would encounter throughout our trip. Salads and spreads are usually prepared without added gluten. However, be cautious of fried vegetable purees cooked in contaminated oils and the very rare addition of wheat to spreads like hummus. Grilled meats, such as chicken hearts, chicken livers, chicken thighs, and lamb, are most often simply grilled with olive oil and pure spices. Gluten-free breads are occasionally available at restaurants, and can be found in many grocery store freezers. Aunt Fudgie was well stocked with g-free pita, challah, and bagels. Pita pockets by GreenLite—an Israeli gluten-free bakery with fresh and frozen products available in major cities throughout the country—were particularly satisfying, tasting quite like their glutenous counterpart. I always kept a piece close at hand as some restaurants, like Gehalim, are agreeable to bringing your own bread. 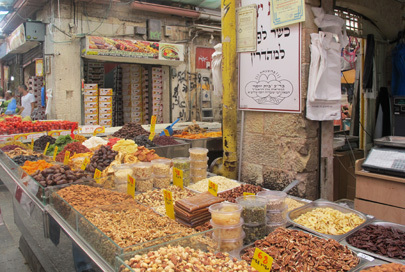 Tasting the diverse flavors of Israel in the crowded and colorful shuks (markets) is an experience that should not be missed. However, gluties beware: Vendors often add flour to their nuts in the roasting process, arguably to increase the weight of their goods and make some extra shekels. Make sure to ask first, or be safe and purchase packaged domestic nuts from the grocery store. Falafel, those scrumptious deep-fried chickpea balls available at every street corner, whether it be in cosmopolitan Tel Aviv or ancient and mystical Tsfat, is the bane of a gluties Israeli food journey. Pitas stuffed with falafel, Israeli salad, spicy skhug, hummus, tahini, and chips (french fries) are the go-to quick meal or snack. 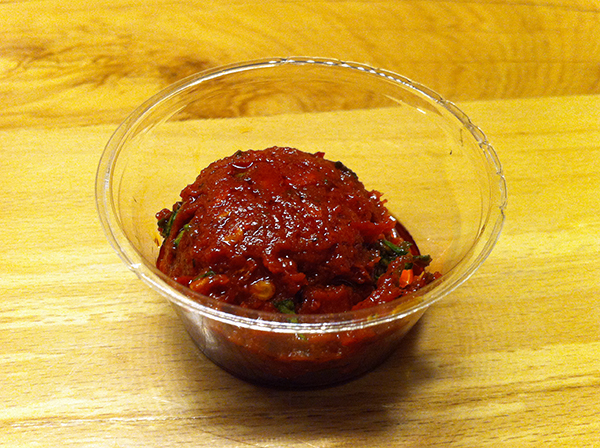 Falafel’s sensuous aroma wafts from the tiny stands that each claim to serve “the best in Israel”. Unfortunately most of their falafel recipes include pesky wheat. But ask around and you will find that there are a token few that make their mixtures purely from chickpeas. 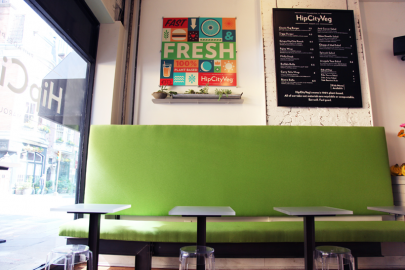 One such gluten-free (and organic) falafel establishment is Hippo Falafel, with two locations in Tel Aviv. Named for the vegetarian animal, Hippo offers a slightly more nutritious version of this indulgent treat, with a healthier frying method and no added wheat fillers in their falafel, spreads or salads. 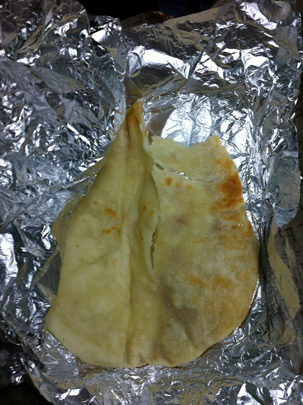 The restaurant tried their hand at gluten-free pitas as well, but failed to develop a pocket that could bear the weight of its fillings. I enjoyed every bite of the hot crispy fritters on a plate surrounded by fresh salads. Picky Mr. Green Bean and his discerning Israeli cousin both gave the thumbs up (a challenge while holding onto a bursting pita pocket). When a gluten-free falafel stand isn’t close nearby, an Aroma Cafe probably is. 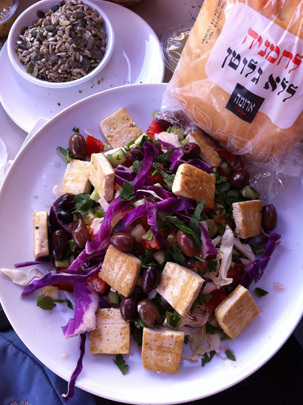 This popular Israeli coffee shop is accustomed to handling gluten-free diners. They offer a number of hearty salad options and a safely packaged gluten-free roll that is airy in consistency and mild in flavor. Portions are huge, as is the case in most restaurants (Like your typical Jewish mother, Israelis never want guests to walk away hungry—generalization #3). But the profusion of bright, fresh vegetables served with every meal leaves one feeling healthfully stuffed. For some finer dining, a couple of restaurants are worth noting both for their superior food and service. In Jerusalem we were generously hosted by our good DC pal, Lox, who spends a few months each year working out of her Jerusalem office. She had been waiting for an occasion to try out Machneyuda, a modern Mediterranean, upscale establishment with a lively and homey vibe. 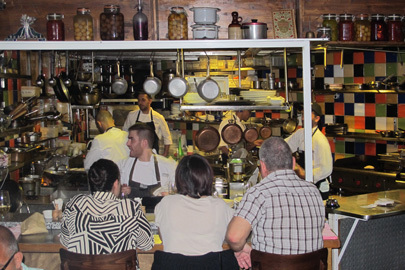 The menu changes daily and all ingredients are sourced from the local Machane Yehuda market, for which the restaurant is named. Dishes like fish tartar with watermelon soup, creamy polenta with mushrooms and parmesan, and risotto ragu cooked with soft sour cheese delighted our senses. The surprisingly patient staff (Israelis tend to be short fused—generalization #4) took their time to parse nearly every dish in search of hidden gluten ingredients. At northern Rosh Pina’s Mizpe Hayamim Hotel and Spa, Muscat offers an elegant dining experience with a breathtaking view of the mountainous Golan Heights. Highly regarded chef Haim Tibi gathers fresh produce from the hotel’s farm to cook up French influenced Mediterranean cuisine. Aunt Fudgie mentioned my “allergy” when making the reservation and our server was prepared with two freshly baked gluten-free rolls, served with a dish of olive oil, balsamic vinegar and a poached tomato slice that melted at the touch. My snapper fish was served over creamed cauliflower, with a bouquet of beautifully arranged vegetables. Our halva and pistachio semifredo dessert was the best sweet treat of the trip, with a chocolate crunch and creamy, subtle sesame flavor that wowed both me, a halva fan, and Mr. Green Bean, not such a halva fan. I end by thanking Aunt Fudgie, the Fudgie family, Lox, and my patient partner, Mr. Green Bean, for their attention to my dietary needs throughout our travels. While our dining experiences were fantastic, it deserves to be said that Aunt Fudgie’s home cooked meals were some of my favorites. 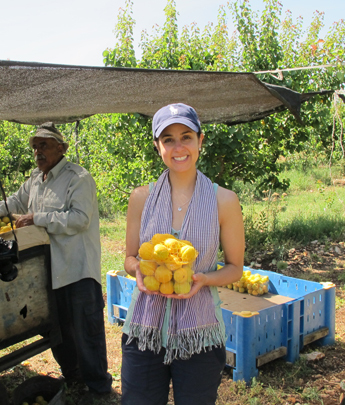 She outdid herself with quinoa and cabbage salads, eggplant and squash purees, stuffed chicken, roast beef, turkey legs, chopped liver and more, combining Israeli, American and Persian flavors into festive meals. My gratitude goes to Aunt Fudgie for transforming her home into a gluten-free friendly zone. Even if you don’t have your own Aunt Fudgie, I am happy to report that Israel is with, if not ahead, of the times when it comes to gluten-free awareness. Categories: Dessert, Fast food, Gluten-Free, Israel, Israeli, Local, Mediterranean, Middle Eastern, Organic, Small Plates, Uncategorized | Permalink. Roti is an unleavened flatbread integral to South Asian cuisines such as Indian and Pakistani. It is also the name of a health conscious fast-food chain in Washington DC and Illinois, and quickly expanding to Virginia, Maryland and New York. I knew I needed to try it when I found out they offer gluten-free bread! I pictured walking into a shop filled with the aromas of curry and basmati rice. You can imagine my confusion when I approached the Roti location in Union Station and read the restaurant’s full name above the entrance: Roti Mediterranean Grill. Roti executives, Larry Lessans and Mats Lederhausen, market themselves as champions of the Mediterranean diet and lifestyle. The Roti website references bonafide resources to describe the ancient diet and its many health benefits. The eating style, based on olive oil, fruits, vegetables, fish and poultry, is maintainable and heart-healthy (I especially appreciate the endorsement of a daily glass of wine). However Roti’s good intentions are victims of the insatiable American appetite, capable of turning any healthy meal into a gluttonous eating escapade. Roti’s portions are large and disproportionately heavy on proteins rather than vegetables. 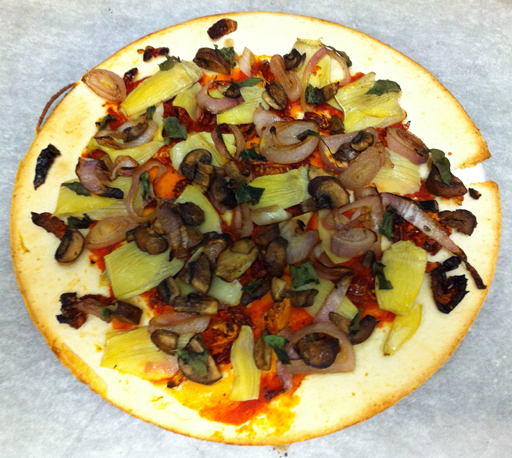 The topping bar offers ample opportunities to pack on extra empty calories or unnecessary fat. 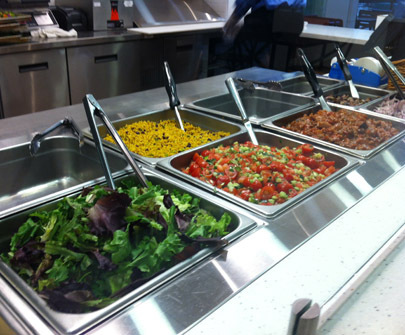 Diners can choose a sauce, a dressing, and various salads already prepared with their own oils. What results can easily fall far from what nutritionists have in mind when they preach the Mediterranean diet. Having said all of that, Roti’s food actually tastes decent. 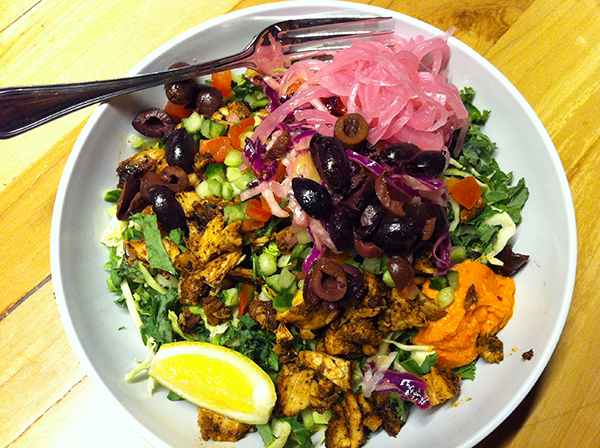 Meals can be assembled as a salad, over rice, or in a sandwich with pita or laffa breads. My choice is the bed of greens with a side of gluten-free pita that is warmed up securely in uncontaminated tinfoil on a sandwich press. The bread is satisfying with a soft, stretchy consistency that endures even hours after cooling (a rarity, as we gluties know). The mild pita flavor acts as a pleasant compliment to the salty spices in Roti’s dishes. With 155 calories, little fat, low sodium, no sugar and minimal protein, this carbohydrate treat is neither beneficial nor all that harmful (there’s the American in me talking). I will be honest, I am only a repeat customer to Roti for the g-free pita. However, its worth mentioning that most of the other items in their repertoire are also gluten-free. The personnel seem to be informed and prepared for gluten-free patrons and help guide the ordering process. While I can’t vouch for the rotisserie spit from which servers scrape shreds of g-free white meat, the Chicken Roti is very flavorful and fairly fresh, being constantly rotated on the grill. The Roasted Vegetables, a blend of carrots, broccoli, onions and peppers, are a bit over-oiled but are vibrant and crunchy. The Spanish Eggplant topping gets lost in an ambiguous sauce that renders this side a bit slimy. But the tomato and cucumber Israeli-style salad is light and simple. Salad Plate with Roasted Vegetables, Spanish Eggplant, Tomato and Cucumber Salad, Olives and Hummus. Overall the establishment is making an effort to provide health conscious food. The restaurant’s interior design and ambiance is closer to a McDonalds than the more upscale local fast-food vendor, Cava Grill (stay tuned for my future review). And though the chicken and steak are cooked on sight, the small staff and compact kitchen space indicates that not much else is. With the fast-food industry making such strides in quality these days, Roti may need to make some changes inorder to keep up. 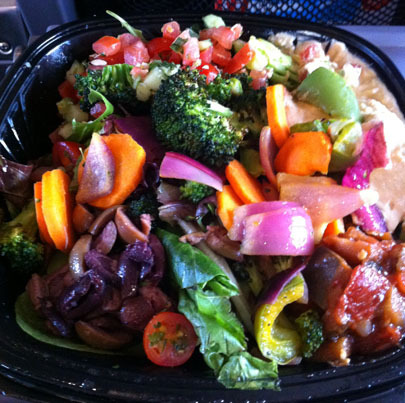 Categories: 2 Spoons, Fast food, Gluten-Free, Lunch, Maryland, Mediterranean, New York, Virginia, Washington DC | Permalink. Just when I was critical of Washington DC being steps behind New York in terms of gluten-free innovations (see Time to BisTANGO), I found myself at ShopHouse Southeastern Asian Kitchen. 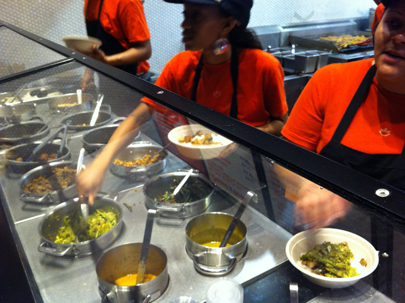 The Dupont Circle location that opened in 2011 is the Chipotle chain’s first venture into eastern cuisine. They have plans to grow this year with new locations in Georgetown and Santa Monica, CA, but not yet New York. Culinary Manager, Nate Appleman, and Director of Concept Development, Tim Wildin, felt that opening first in NYC “would have been too easy”. To succeed in a market such as DC is a truer measure of success. I typically shy away from fast food vendors due to the fact that “fast” rarely co-exists with patience and care. But a rumor that turned out to be true brought me into ShopHouse: The entire menu is gluten-free! As the news settled in, aromas of crushed spices, coconut milk and jasmine rice filled my senses and I surveyed an open field of options. ShopHouse is inspired by the multi-use buildings that line the streets of Thailand, Vietnam and Malaysia, with street-level restaurants and upstairs living quarters. Meals based in fresh vegetables, noodles, rice and spices are whipped up in minutes and served piping hot to hungry mouths. ShopHouse is far too American to resemble authentic Southeast Asian kitchens. Yet, the melding of various Asian flavors under one roof echos the multicultural cuisine in Singapore that has resulted from a melting pot of Southeast Asian settlers. Diners start by picking the base for their bowl, either brown rice, jasmine rice, chilled rice noodles, or napa cabbage. Next one selects a protein: grilled chicken satay, pork and chicken meatballs, grilled steak laab, or Tofu. One vegetable is included with the bowl: broccoli, charred corn, eggplant or green beans. The dish is topped with a choice of green papaya slaw, pickles or fresh herbs, then one of three sauces categorized by heat levels, and finished with a sprinkle of toasted rice, crushed peanuts, or crispy garlic. 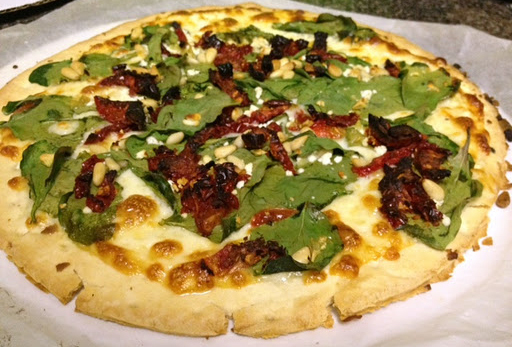 Each component is packed with flavor, making it easy to build combinations that confuse with too many leading ladies. Diners should resist the urge to pile on everything and try to keep it simple. As a first timer, with pressures from my server and the line forming behind me, I made some snap decisions that I might rethink next time, like adding both papaya slaw and pickles atop my eggplant and chicken lettuce bowl. 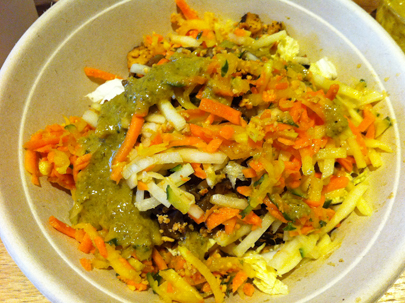 Salad bowl with chicken, eggplant, green papaya slaw, pickles, crushed peanuts, and green curry. Mild palettes should beware. While the restaurant tweaked its ingredients to make the food less spicy, heat still abounds (in other words, Mr. Green Bean will never see the inside of ShopHouse). I do recommend getting your sauce on the side, as most dishes wont even need the extra flavor or the calories. This might be a practice makes perfect situation, but I would appreciate a bit more direction from the servers to strike it right every time. Unusual for a restaurant of this genre, everything is made in-house, from intricate spice blends to complex curries. While management admits the food is hardly traditional Southeast Asian cuisine, recipes flirt with authenticity by using rice, as opposed to wheat, as the main grain for items like the meatballs and noodles. I admit that I feel a certain affinity for cultures whose cooking is based in grains like rice or corn, as if my DNA is more closely linked to those ethnicities. When I traveled throughout Southeast Asia years ago, I had no idea the cuisine suited me so well. Perhaps another voyage to across the globe post celiac diagnosis is in order. Categories: 3 Spoons, Asian, Fast food, Gluten-Free, Lunch, Southeast Asian, Uncategorized, Washington DC | Tags: Fastfood | Permalink.